I have prided myself on being the best career nanny I could be for over a decade. I have a college degree, have worked for each family for a long time, and I have wonderful written references. But, I made one huge mistake, the biggest mistake I ever made as a nanny, by walking out on a nanny job. 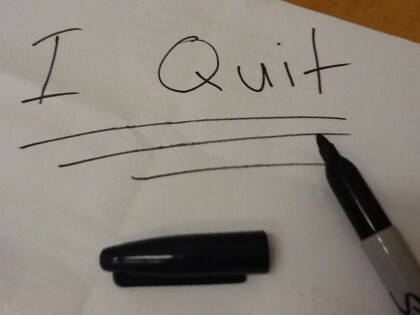 Walking out on the job was a mistake because every agency owner and parent I interviewed with after walking out on the job asked me why I left my last job. Up until that time, I was offered most nanny jobs I interviewed for. But, after I walked out on a job without notice (no matter that I was mistreated and it was justified) the agencies wouldn’t send me on interviews. The parents I interviewed with who asked why I left and found out I didn’t give notice, didn’t call back for second interviews. One agency owner made a good point when she asked me, “If the job was so horrible why did you work there for nearly three-years?” She was right. I wasted nearly three-years, because I could have and should have had a glowing reference from the family, but instead I ruined that reference by getting angry and hurt and walking out without notice. I actually had to accept a lower paying nanny job I found on a nanny web site, with an hour commute each way because I was desperate for a job. I read an article on the Be the Best Nanny Newsletter web site by a nanny and founder of Nannypalooza, Sue Downey that explains that the lasting impression made by employees becomes the basis for reference checks for years to come. Nannies that leave families in an unprofessional manner will not be able to depend on glowing recommendations. Instead of walking out on the job Sue Downey explains that the last days of a job are an opportunity for nannies to demonstrate to parents that they are deserving of great recommendations. This may be difficult to accomplish when a nanny feels angry and hurt. But, the employees last days and weeks are the memories parents remember most when giving job references. When giving your reasons for leaving keep the discussion as positive as possible. While it is fine to admit you need a higher salary or to work less hours, personal attacks will hurt your chances of getting a good reference. Make it clear what day will be your last day of work and ensure the parents that you will work just as hard the last days of employment as you have before you gave notice. Obviously, if a nanny feels unsafe at a job or is being sexually harassed they should definitely walk out on the job. Otherwise, learn from my mistake. Stick it out until you find a better job, then quit in a professional manner allowing the parents a minimum of two-weeks (but typically a month in most nanny work agreements) to ensure you get a great reference from the parents.